Feeling high from my clean laundry, I decide to go one step further and get a hair cut. Mistake #1. I had a good feeling about a nice old barber that had helped me with directions earlier. Old equals well experieced right? Mistake #2. As I sit down he tells me that he had more British than American customers during the war in the 40's. Crap. He asks my age and tells me that he is 78 years old. Crap. As he picks up the scissors his hands shake. Crap. I know that this is going to be bad, but I wonder just how bad. He starts taking one handed scissor swipes at my hair with all the finess of a hungover landscaper trimming a bush. After 5 minutes he concludes his onslaught and I survey the damage. My scalp and ears have survived the attack, but my hair isn't as lucky. Let's talk numbers: The top ranges from 1.5" to 1/4", the sides are short but have an 1/8" difference. And as the piece de resistance, I have longer hair in the back which creates a mullet like appearance. 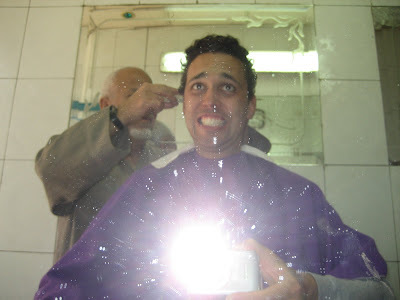 Having thought that a nice old man with Parkinsons Disease would never try to rip me off, I failed to ask him how much money this would cost me before the haircut began. Mistake #3. He charges me an outrageous $8! When I get back to my hostel, the usually extremely polite receptionist confirms my fears, "yes it looks very bad". At this point I still just thought this would be a funny story and not a train wreck. Ah, the barber was your mistake. You should have let a Berber cut your hair. So did you get the Brazilian as well or what? so you refuse to buy a map to climb a mountain and get lost in snow but pay $8 for an uneven mullet? yah that sounds like a good use of your travel funds! :) i want to see pictures of the back!! August, trade her for pictures of her front...wow inappropriate? I love this post! the sense of impending doom that you could walk away from, but don't out of a sense of pure social decorum. marvelous.